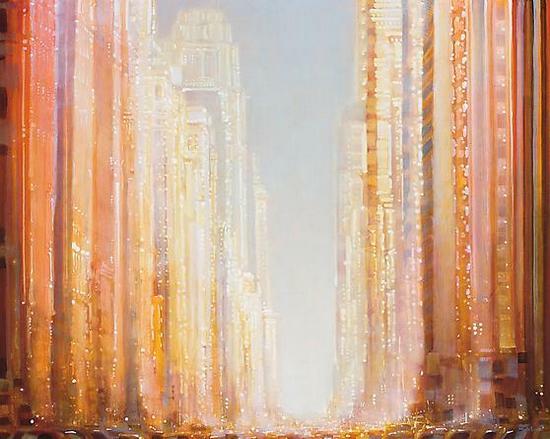 Mark Innerst's recent paintings of New York City fuse the artist's sense of awe with his confident ability to improvise and invent. 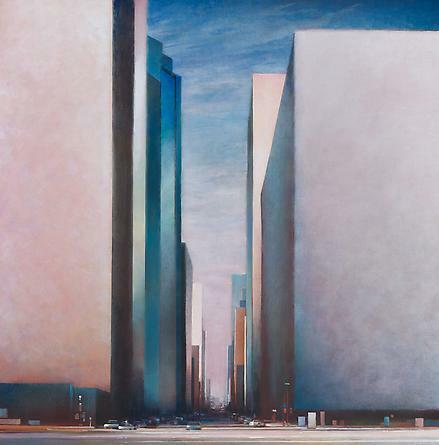 Innerst's midtown cityscapes and Hudson panoramas use geometry as a scaffolding that allows his considerable skills as a colorist to render the city as impossibly beautiful, gleaming and sleek. I recently spoke to Mark Innerst to ask him a few choice questions about his work and his background. Tell me briefly about your background and education. I understand that as an undergraduate in Pennsylvania you were mainly interested in printmaking. Kutztown State College ( now a university) provided me with professors and courses of a great variety. From "Old Master Drawing Materials" to a visiting artist program including Vito Acconci, John Cage and many others. I did independent study in printmaking as well as life drawing. An internship program took me to NYC in my final semester and there I stayed. For years you mainly worked in acrylic and have been transitioning to oil. How and why did that come about? I worked in acrylic for many years. The introduction of fluid acrylics was what got me started. To be able indulge in rich transparent glazes, pure intense colors, that dried overnight was exciting. At some point I found I had the patience for the drying time of oils and that I didn't need to be so indulgent in that glazing and now find myself very comfortable with oils. How did your "Midtown" series first develop? The Midtown subject came to me as I was packing for our yearly rental in Florida. I wanted a compact focused project to take along. That view of those particular buildings was something I'd done once before but now seemed like something worth exploring further. I was in the mood to be neat and make nice straight edges that didn't have to be corrected. Usually I begin things in a much more gestural painterly way. I thought I'd come back from vacation with three finished paintings. Instead, they took much longer to complete and all those edges did have to be repainted any number of times. Once home making larger versions seemed natural and it did become a sort of series. How do you keep your work so fresh? When you ask how I keep things fresh I'm tempted to resist because it's such a compliment. It might be that I've moved around quite a bit and the world around me is new, and generally speaking the world around me is what I paint. Frames. Well before NY I was infatuated with frames. Whether at a museum or a junk shop they would take my attention. I just like them and they do in fact protect the painting and allow one to handle it, which I think is appealing. I was an art handler myself early on, in a gallery setting, and I saw how easily damage can happen. I began making my own frames half out of necessity and half out of pleasure. 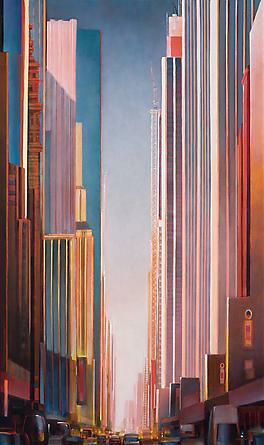 The buildings in the "Midtown" series move towards abstraction and linearity. Is that your way of idealizing the city, or it is simply an attractive direction to take with your work? That particular row of buildings in midtown is simply that linear. They've stood out in my mind ever since my first trip to the city many years ago. At first they struck me as imposing and a little ominous, but now appear harmonious and graceful. Over the years I've seen a pattern where my subjects, through repetition, evolve and become simplified and more abstract. In this case it's a more faithful and straight forward portrayal. After some years of post modernist architecture, it was interesting to reflect on this landscape of modernist principled architecture.